Most people understand the threats posed by various types of pollution, but the potential damage light pollution can have on our health and the ecosystem doesn’t always get a lot of attention. Moving to outdoor LED lighting was supposed to help the problem, but it's made matters worse. 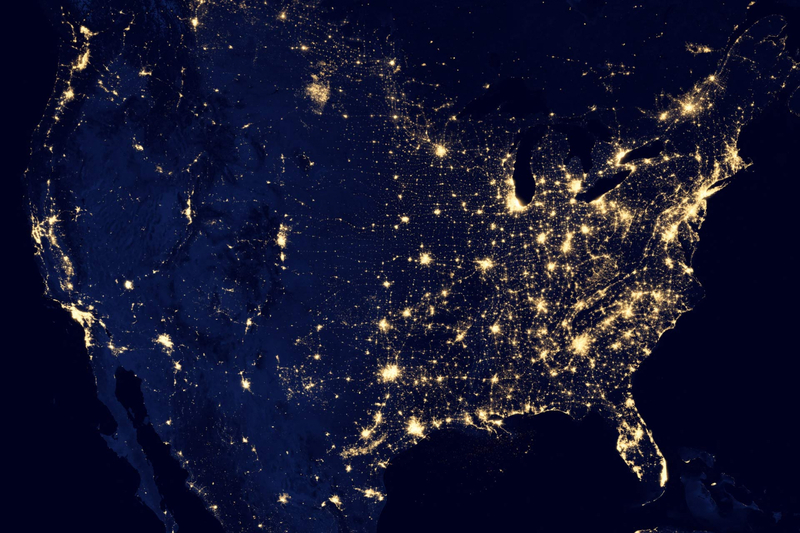 An international team of scientists used satellite-based sensors to determine if the Earth’s surface is getting darker or brighter at night and to find out if LEDs are saving energy. What it found was that due to the lower energy costs associated with light-emitting diodes, many areas use the savings to buy even more LEDs—a practice the researchers call the “rebound effect.” This means the amount of outdoor lighting has been increasing over the last few years. "We'll light something that we didn't light before, like a bicycle path through a park or a section of highway leading outside of town that in the past wasn't lit," said Christopher Kyba, the study’s lead author. “The world has experienced widespread 'loss of the night,' with half of Europe and a quarter of North America experiencing substantially modified light-dark cycles," the researchers explained. Outdoor illumination grew at around 3 to 6 percent per year in the second half of the 20th century. The new analysis, which was only conducted in October to avoid extra illumination from the holiday period, found artificially lit outdoor areas grew by 2.2 percent from 2012 to 2015, while total radiance growth increased 1.8 percent each year. 60 countries saw their nighttime illumination increase between 100 – 150 percent during these three years, while 20 others recorded a jump of 150 percent or more. Growth mostly occurred throughout South America, Africa, and Asia, while War-torn zones like Syria and Yemen saw declines. Developed nations such as the US, which were already brightly lit, remained stable. As the Day-Night-Band sensor onboard the Suomi NPP weather satellite used to collect this data cannot see the bluer wavelengths emitted by many LEDs, the planet is likely to be even brighter at night than results suggest. "We can say with fairly high confidence even though we didn't measure in the satellite an increase in these countries, they are nearly certainly increasing in brightness in terms of how human beings would perceive the light," says Kyba. The move from older technology like filaments, gas, and plasma to LEDs could have an impact on human health by affecting levels of the sleep-inducing hormone melatonin and disrupting our circadian rhythm. It’s also a problem for nocturnal animals, plants, and microorganisms.